that were slated to start at the beginning of September in Wyoming and Idaho. In August, U.S. District Judge Dana Christensen put a two-week restraining order on the hunts while he decides whether to uphold the U.S. 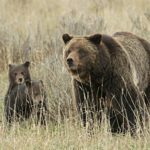 Fish and Wildlife Service’s 2017 decision to delist grizzlies around Yellowstone National Park. That order expires around 5 p.m. Thursday. Hunting licenses were issued for 22 grizzlies in Wyoming and one in Idaho, and the hunt could start as soon as the restraining order lapses. It would be the first grizzly hunt in those areas in more than 40 years. Nicholas Arrivo, an attorney for the Humane Society, a plaintiff in the case, says the motion Wednesday asks to extend the previous restraining order for another two weeks or until the judge makes his decision on the case, whichever comes first. “We think it’s a kind of bare minimum, common-sense protective measure that needs to be in place,” Arrivo says. If the judge decides in favor of the Fish and Wildlife Service, it would mean putting the management of grizzlies in the Greater Yellowstone Ecosystem, which contains parts of Montana, Wyoming and Idaho, into state government hands. The motion rests on the idea of “irreparable harm” to the grizzly bear. If the hunt begins and the judge still hasn’t made up his mind, hunters could take bears no matter which way the judge decides. “Even if we win next week on the merits, it may be actually be too late to undo the damage,” Arrivo says. About 700 grizzlies live in the area as a whole, and Montana did not issue any grizzly hunting permits this year. The judge has not yet decided on today’s motion. The U.S. Fish and Wildlife Service believes the bear has recovered in the area, after rebounding from an estimated 136 bears when the animal was federally listed in 1975. They’re expected to decide on delisting the grizzly population in and around Glacier National Park later this year.